CINCINNATI (AP) — A gunman carrying enough ammunition to cause “a bloodbath beyond imagination” killed three people and wounded two others Thursday morning at a high-rise office building in the heart of Cincinnati before dying in a hail of police gunfire. 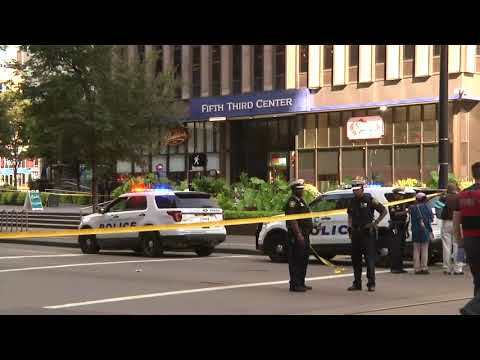 The shooting at the 30-story Fifth Third Center sent people running for cover across the city’s Fountain Square amid cries of “Shooter!” Police responded within seconds, and four officers opened fire, bullets smashing through glass doors and the gunman falling to the floor, authorities said. Police identified him as Omar Enrique Santa Perez, 29, but said they don’t know what motivated the attack. “A very horrific situation,” Isaac said at the scene. The building is home to Fifth Third Bancorp’s headquarters along with a number of other businesses, including ice cream, pastry and sandwich shops. Police said the gunman, a Cincinnati-area resident since 2015, wasn’t a current or past Fifth Third employee. They said he went into a sandwich shop and possibly other businesses before entering the lobby and opening fire around 9:10 a.m. Afterward, police swarmed the gunman’s apartment in North Bend, Ohio, about 15 miles west of Cincinnati. Michael Richardson, who works in the bank building, told The Cincinnati Enquirer that he was standing outside the entrance when he heard gunshots in the lobby. “I looked behind me and saw the guy — he shot and then he shot again. After that, I started running,” Richardson said. Leonard Cain told The Enquirer he was going into the bank when someone alerted him about the shooting. He said a woman wearing headphones didn’t hear the warnings and walked into the bank and got shot. Jessica Hanson, who works on one of the lower floors, said a co-worker had taken the elevator down to get a drink, and when the doors opened, she nearly stepped on a man’s body. The woman got back in the elevator and rode up to her floor, where Hanson said she was in shock and unable to form complete sentences. “Then we knew what was going on,” Hanson said. Jaenetta Cook, who manages a bakery on the first floor, said she hurried to lock the door after the first two shots. Then, it “sounded as if they were getting closer and closer.” Cook said she and two other employees hid in the bathroom. “I made it out to see my kids, to see another day,” she said with relief. The Hamilton County Coroner’s office identified the victims as Pruthvi Kandepi, 25; Luis Calderon, 48; and Richard Newcomer, 64. One died at the scene. Two more died at University of Cincinnati Medical Center. The wounded were listed there in critical condition and fair condition. Fountain Square is often the site of concerts, dancing, food trucks and other events around lunchtime or in the evenings. Associated Press writers John Seewer in Toledo, Alexandra Villarreal in New York and AP Photographer John Minchillo in Cincinnati contributed to this story.